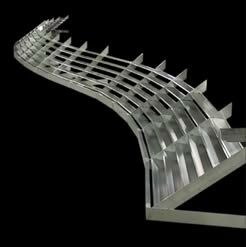 Quality Custom Work in Special Steel and Aluminum: In today's fast-paced industry, even with the depth and scope of our standard lines, the need for customization is constant. Flexible manufacturing techniques, exceptional product knowledge and innovative designs allow Architecture Metals to meet these dynamic challenges on a regular basis. Complimenting building architecture and satisfying environmental demands is paramount in every design.